Hey, gang- long time no post for me. Didn’t realize I had been neglecting my blog for so long now. Here’s a quick run down of some of my art happenings this summer. I’ll post more about my con-trips to the Metropolis Superman Celebration and ConKasterborous and a few movie reviews on my Have Geek Will Travel blog site. 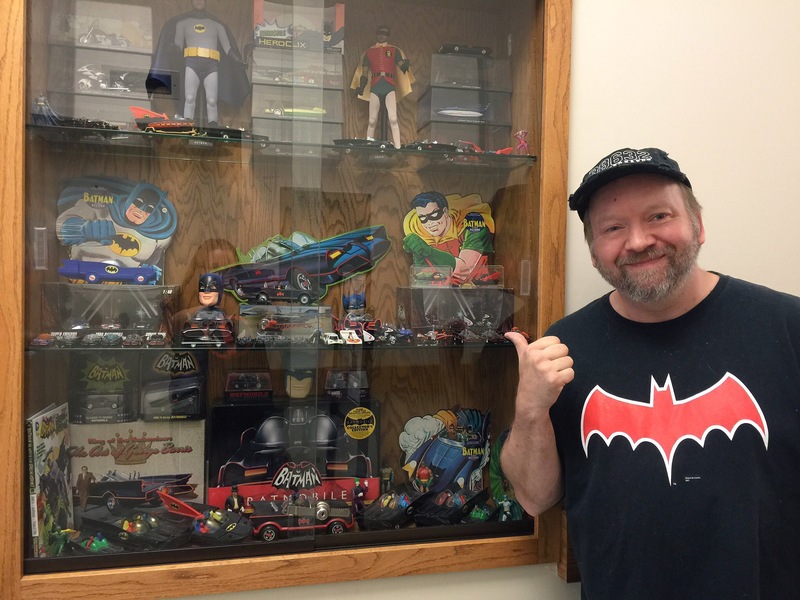 Right now you can read about my Batman TV Show 50th Anniversary display that’s currently at the First Regional Library in Hernando, MS. 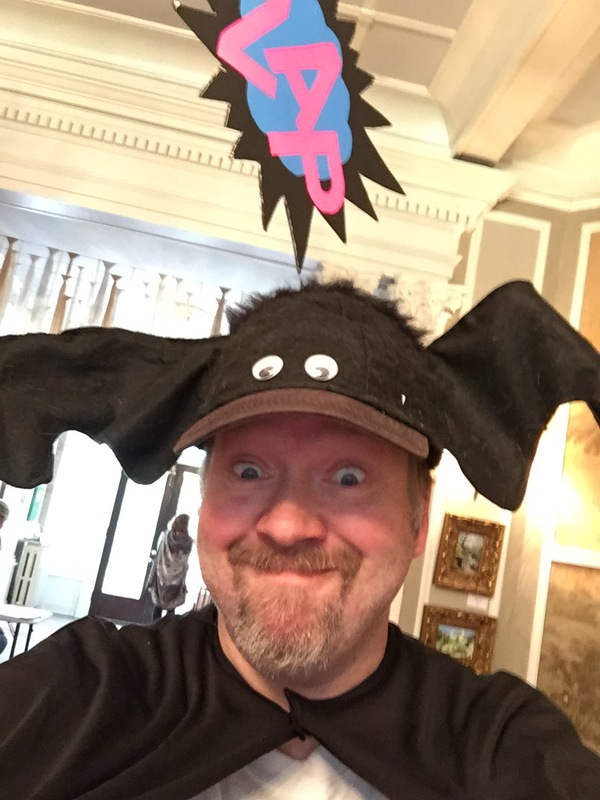 The show and I both turn 50 this year…YIKES! 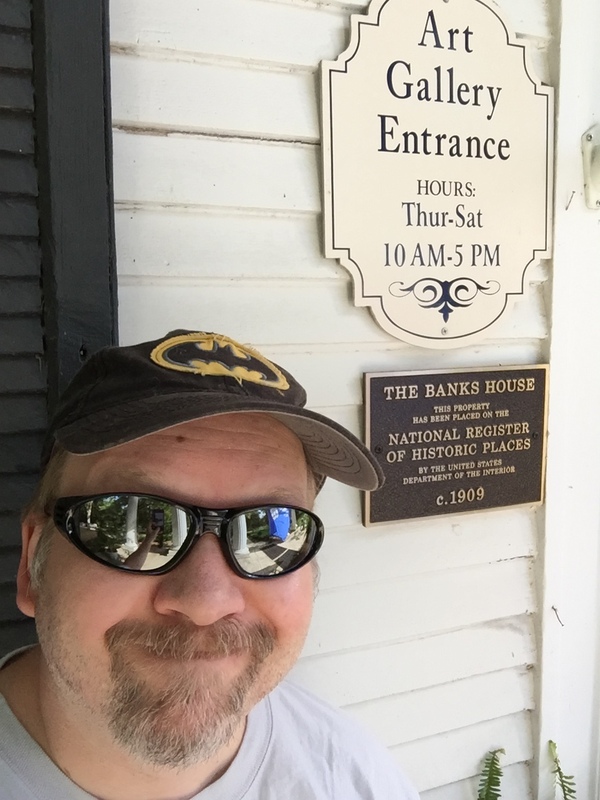 Earlier this month I headed over to The Banks House in Hernando. It’s just down the street from our library and across the street from City Hall. The Banks House is an old southern plantation style house that is home to the DeSoto Arts Council (for now- more on that later). 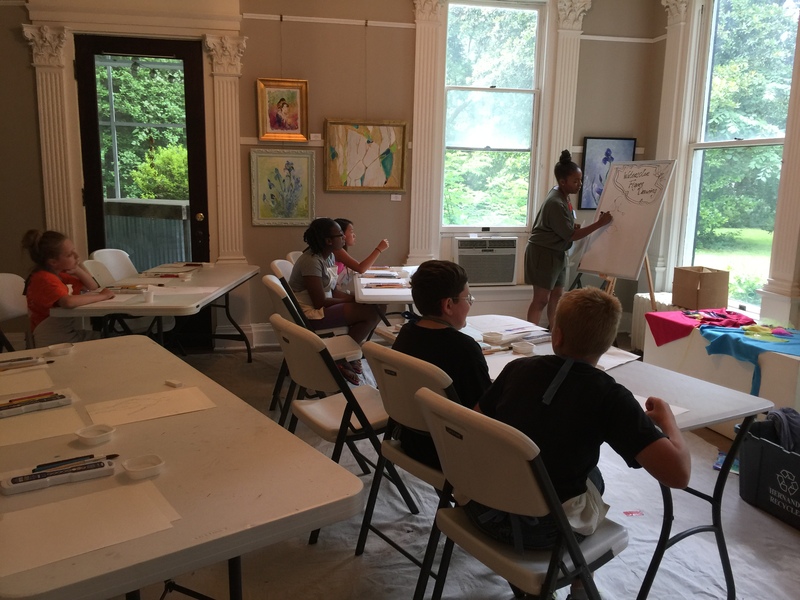 I had been asked to teach a cartooning class during their summer art camp. 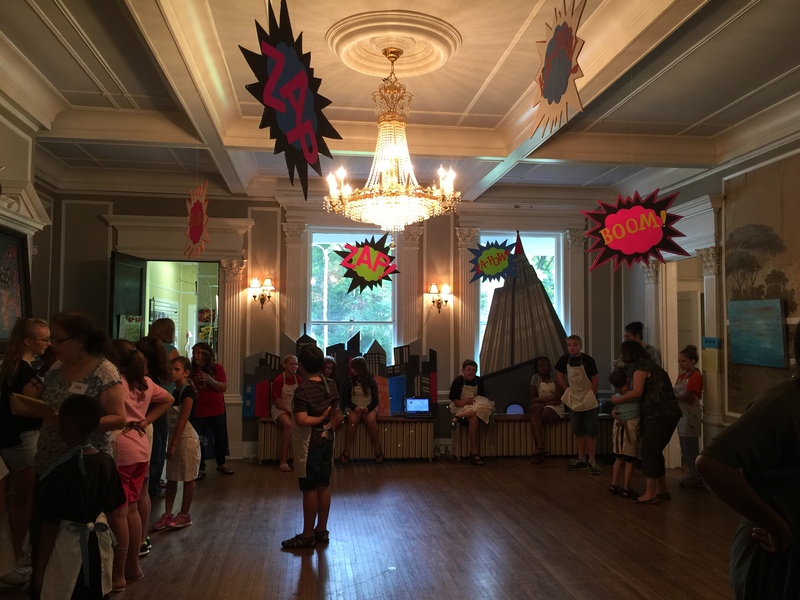 This year’s theme was “Super-Heroes“, and the main room was decorated in hanging onomatopoeia (sound effects). 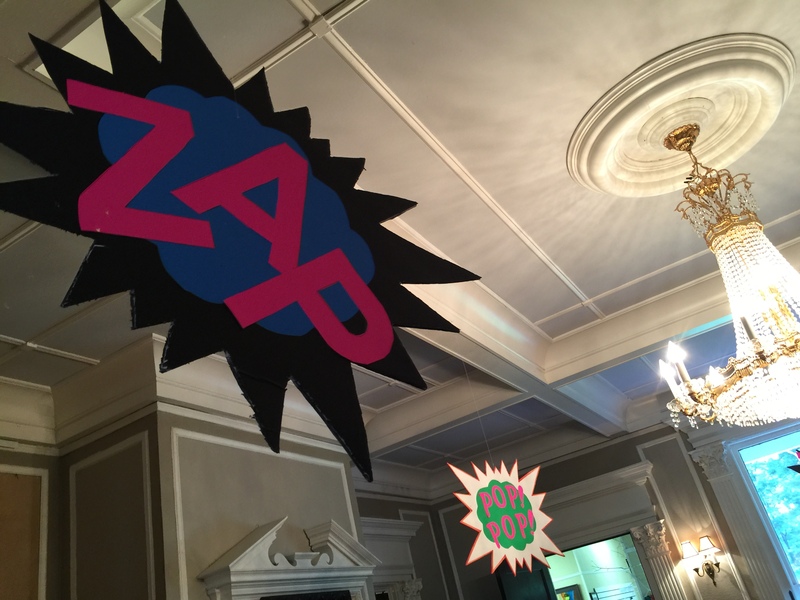 “ZAP“, “POW“, “BANG” signs hung from the ceiling and looked just like scenes out of the old ’60s Batman TV series. Many of the instructors and volunteer staff dressed up as heroes or villains. 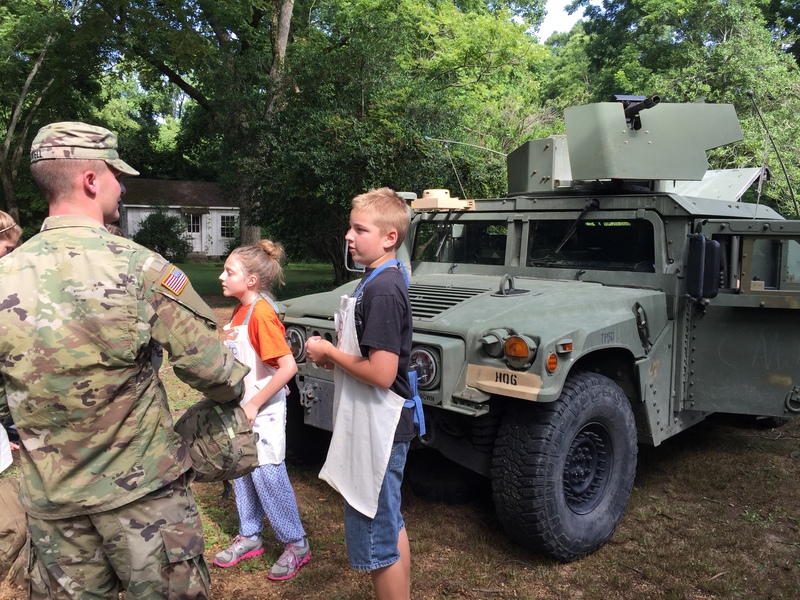 Some real life heroes from the National Guard showed up to talk to the kids and do some show and tell about being in the military. 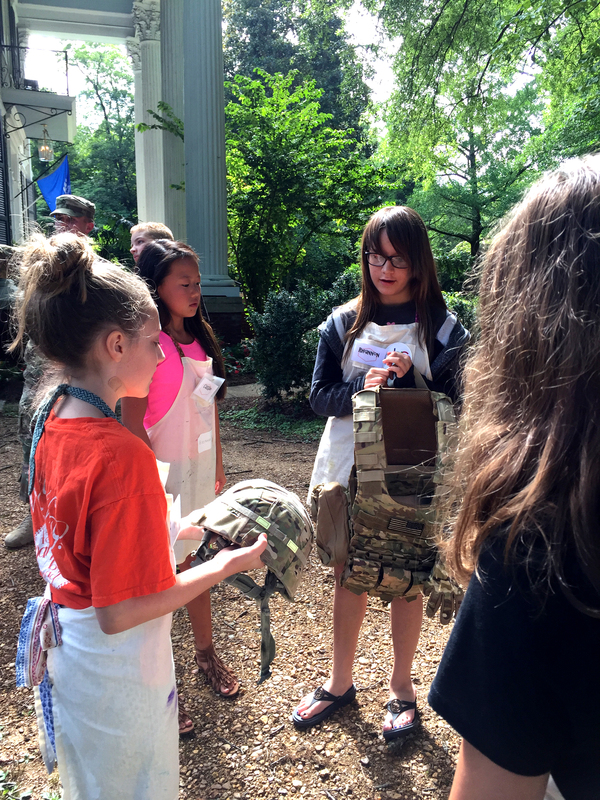 They brought along their “FUNvee” and lots of the equipment they use when deployed on missions. 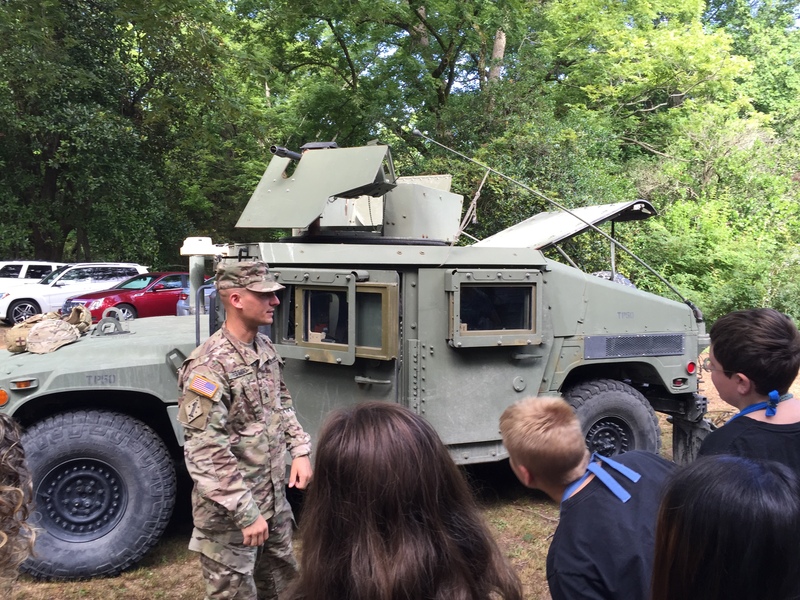 The kids and I not only got to ask questions and check out the equipment, but we also got to sit in the vehicle! 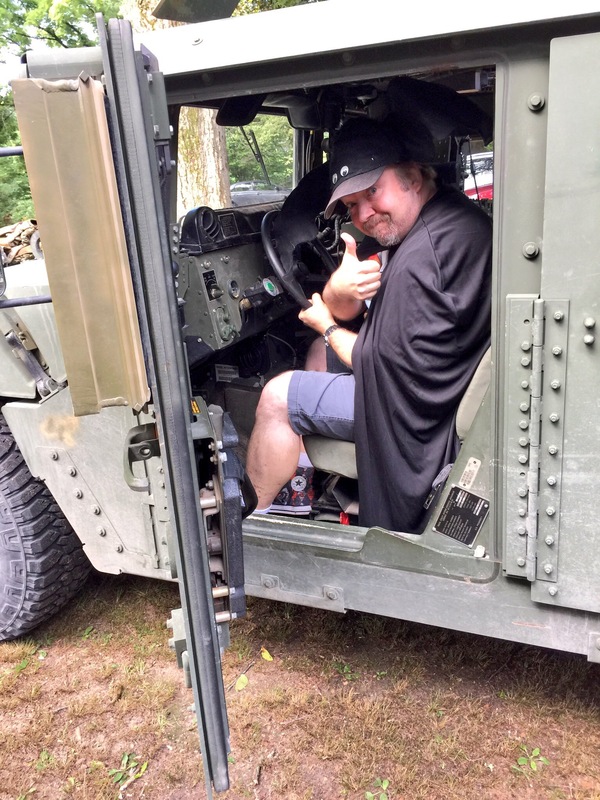 It’s not the Tumbler, but it was pretty cool. Back inside the kids got to work on making their own costumes and logos for their characters. 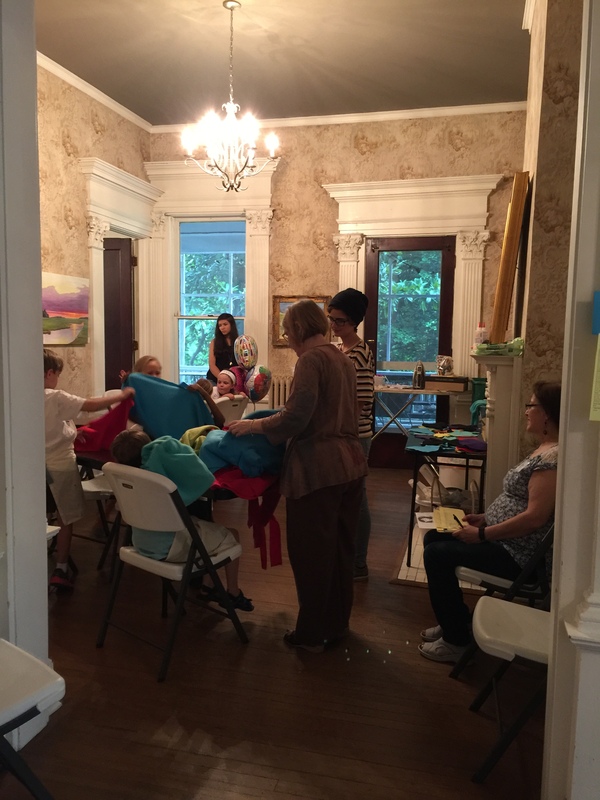 There were many different art classes, including figure drawing. 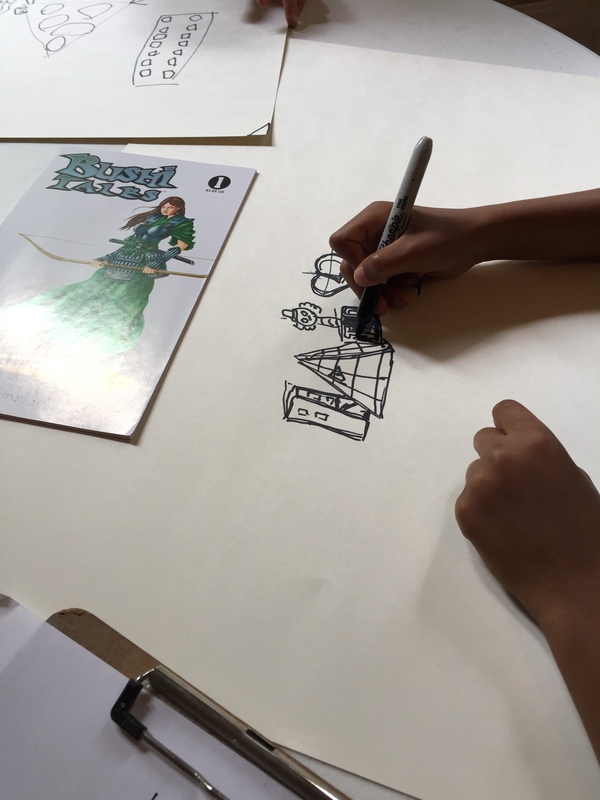 Throughout the week the kids worked on creating their own characters and making comics. 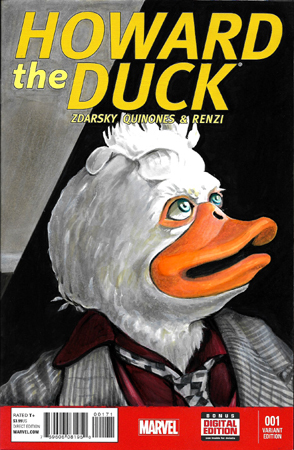 My class was a basic cartooning class. I talked a bit about comic book terms and how the storytelling should flow across the pages, but I focused mainly on teaching using shapes and colors. I had four different classes divided by age groups. In one of my younger classes, a 7yr old boy named Abel really impressed me. I usually start off having the kids shout out shapes. Then I have them turn those shapes into objects, faces, or figures. 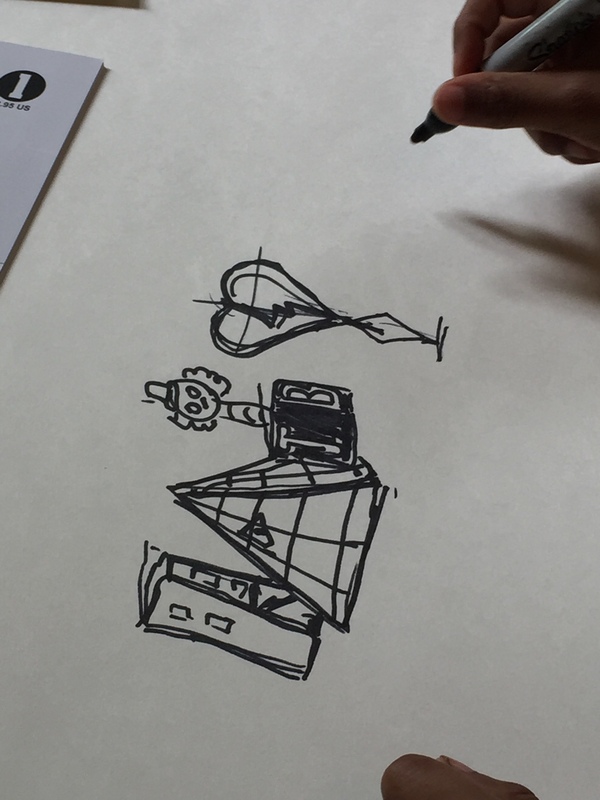 While other kids were still trying to draw a rectangle, triangle, circle, or square, Able was not only drawing a building, pyramid, and Jack-in-the-box but using perspective! 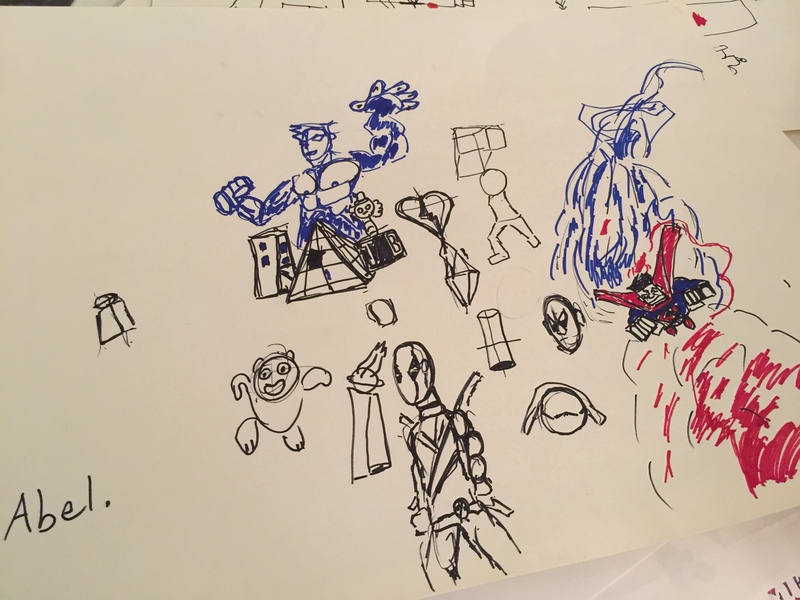 I’ve gotten kids to draw a horizon line and a one point perspective road or river, but have never seen a kid his age understand it and be able to draw it. He finished his 3 shapes pretty quick and while the other kids were still struggling to turn their shapes into something, he was drawing other things including Deadpool. I asked him if he liked Deadpool and he said, “Yeah, especially the movie.” I had a lot of great students, and hope they walked away knowing something new. 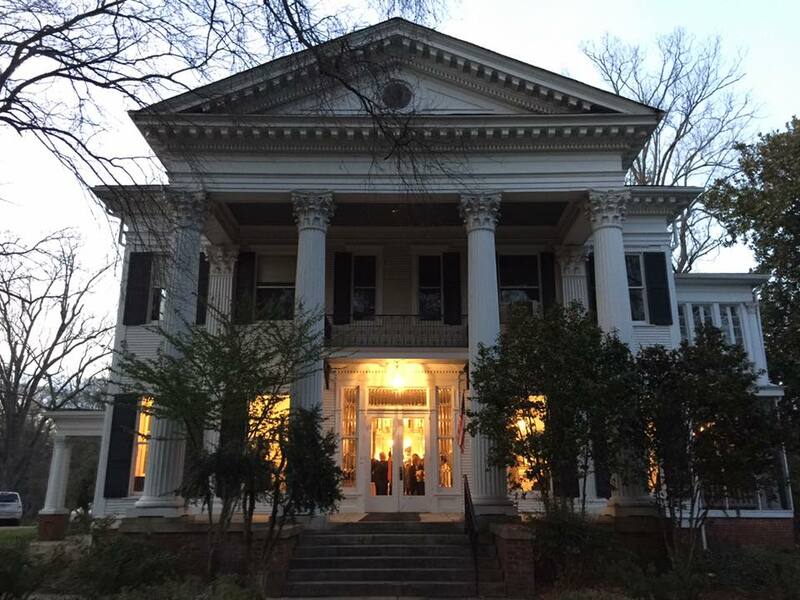 It was a great time teaching again at the DAC, but I was sad to hear that the group is losing our home at the Banks House sometime in September. It’s a great space and the grounds and gardens surrounding the big house are huge. I’ve heard it’s going to be a residence again. Good to know it will be lived in and not torn down with some of the Hernando West development. 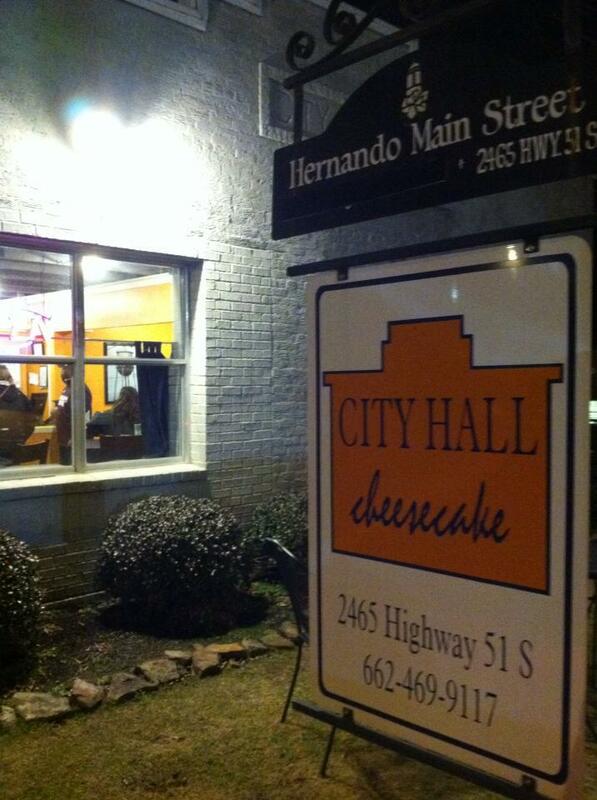 The new location will be in the original Hernando City Hall building and former City Hall Cheesecake location (which moved up the street on Commerce). 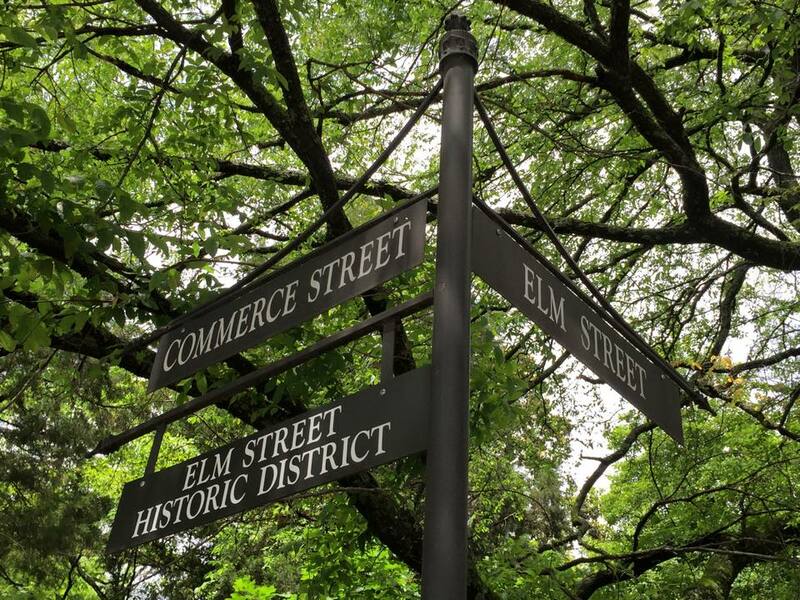 It’s not too far around the corner from the Banks House on HWY 51 off of Courthouse Square. 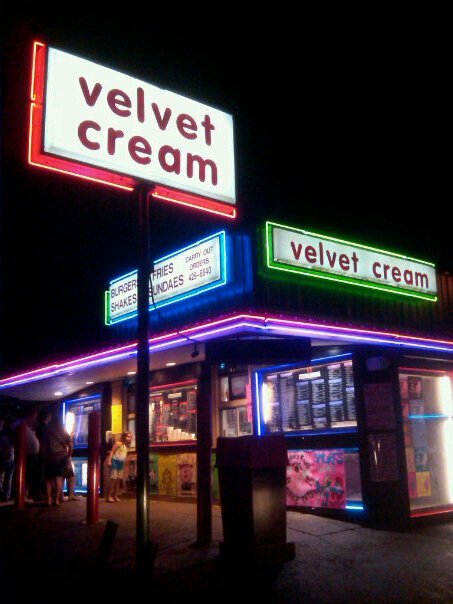 It’s a great old space (and not too far from “The Dip“). It’s a lot smaller, but will have more foot traffic and should be a good new home for the gift-shop. I believe it should have space downstairs for classes, too. 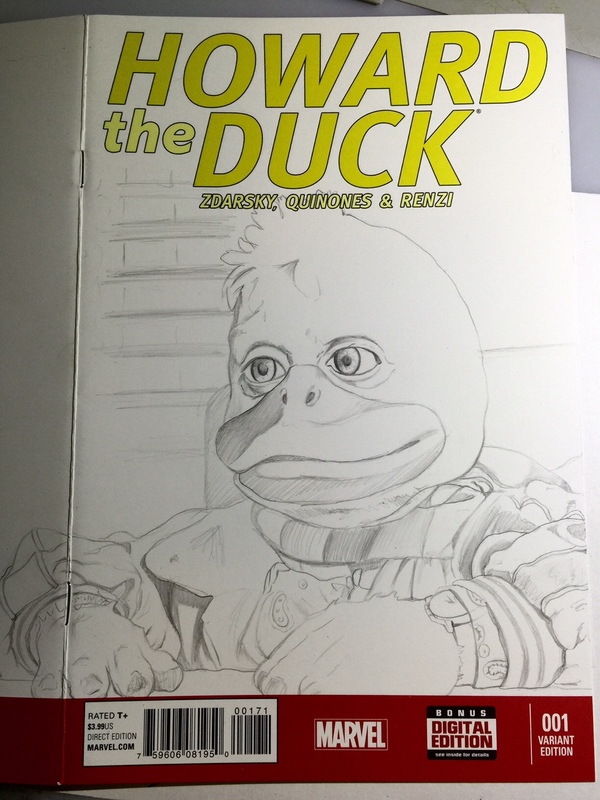 Since my last post I’ve been back at the drawing board again- this time working on another Howard The Duck sketchcover. I’ve got a few shortboxes full of blanks I need to work on. 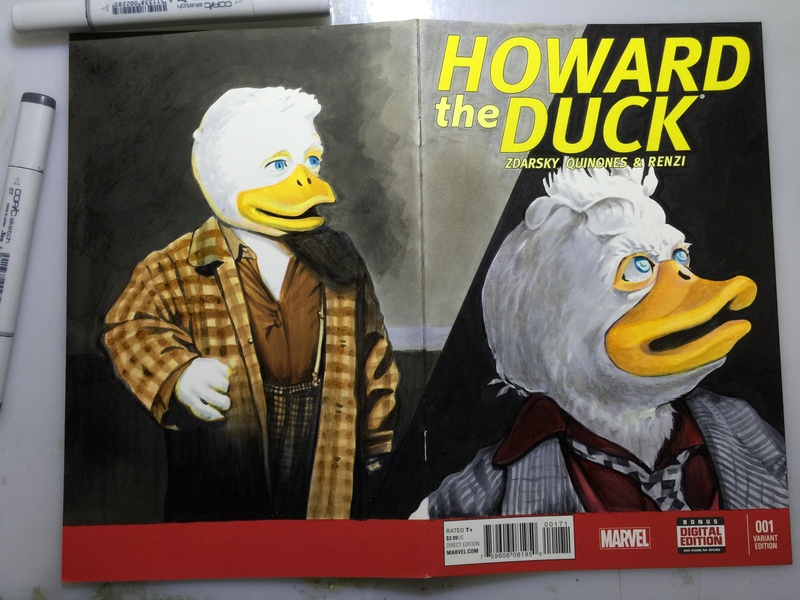 Normally I don’t do a lot of commissions but Jason Prince, the owner of Comic Cellar, said he had a customer who had seen my previous “Howard The Duck” movie sketchcover (below) and wanted one. I said okay, as long as I didn’t have to draw the same thing again. He said cool and that I could do what ever I wanted. 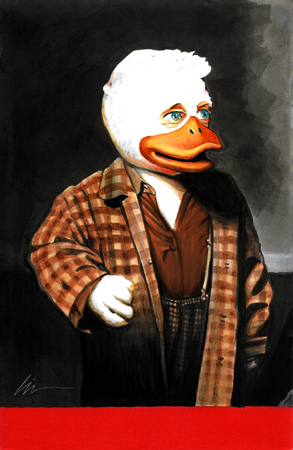 I know the Howard movie isn’t loved by everyone, but it’s one of my favorites. 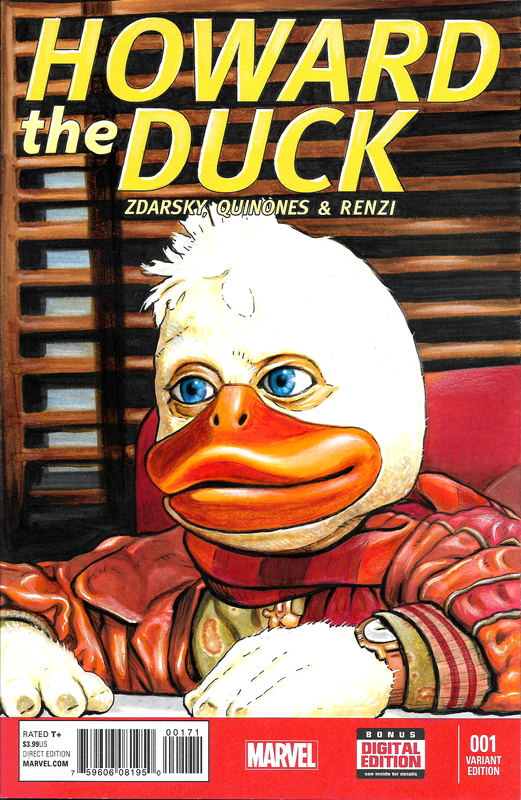 With both of them I started out with a blank sketchcover and a pencil, then did the coloring with Copic and Prismacolor markers. 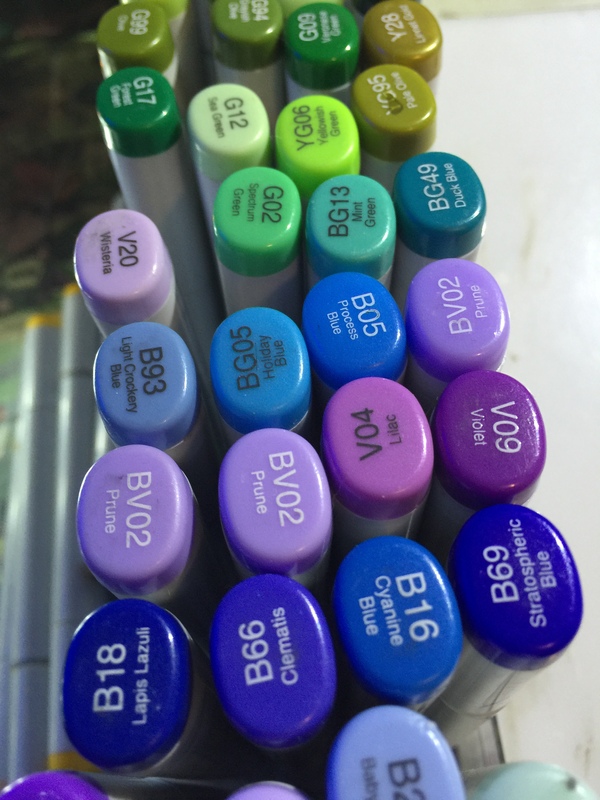 I use Copic White and white Prismacolor pencils for the highlights, and then Krylon Matte Finish spray fixative to seal it once I’m done. I’ve got a few sketchcovers for sale at Comic Cellar, and will be doing a sketchcover charity event to benefit the Hero Initiative and celebrate Jack Kirby’s birthday at Comics and Collectibles in Memphis the end of August. 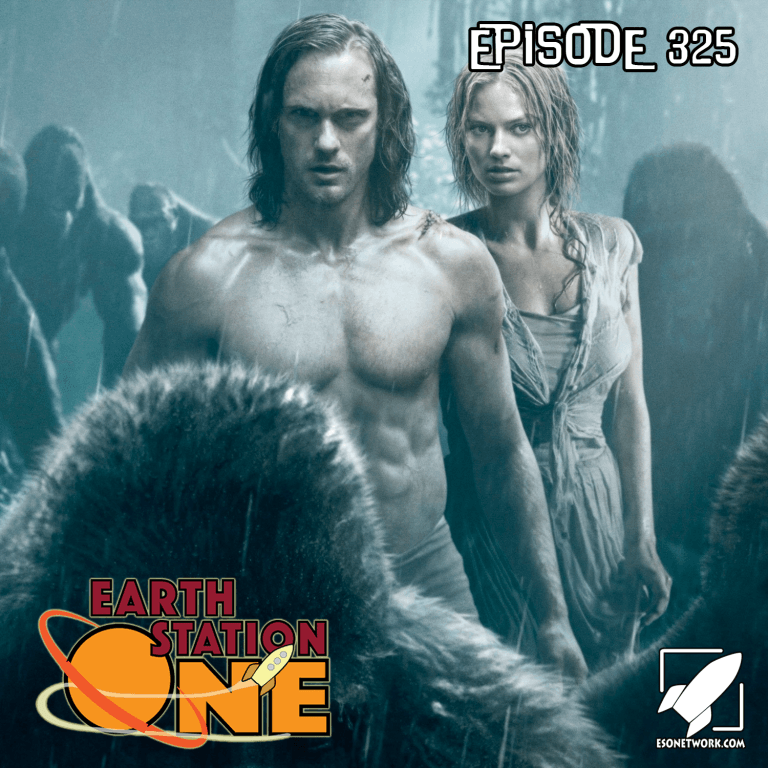 This past month my wife Nicki and I went to go see the new Tarzan movie, and I was asked to discuss it on the Earth Station One podcast. I also got a mention on the Comic Book Central podcast in the Mehcab Brooks episode #137. Saw the new “Ghostbusters” (twice) and loved it, and am really looking forward to “Suicide Squad“, “Doctor Strange” (which comes out my birthday weekend), and “Star Wars: Rogue One“. Got to wrap it up for now, but will try to update more often. 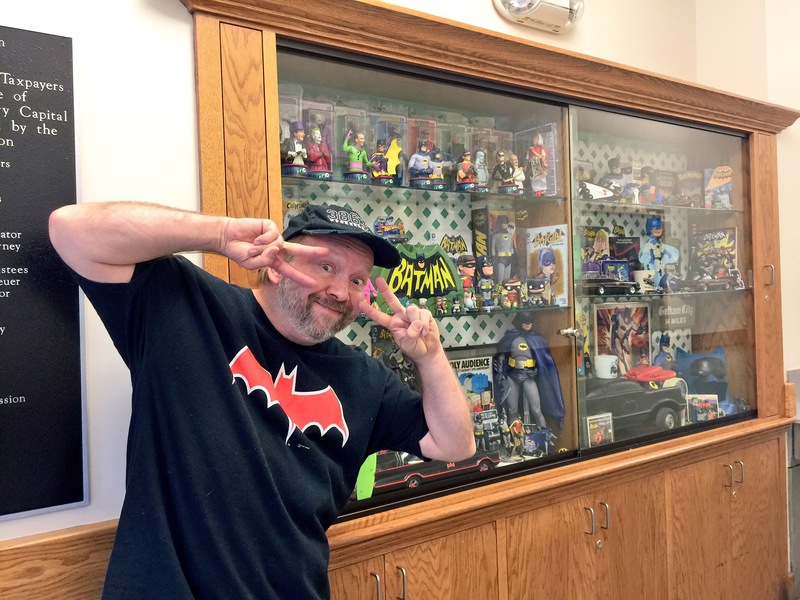 Hope you get a chance to check out the Batman display at the Hernando Library. 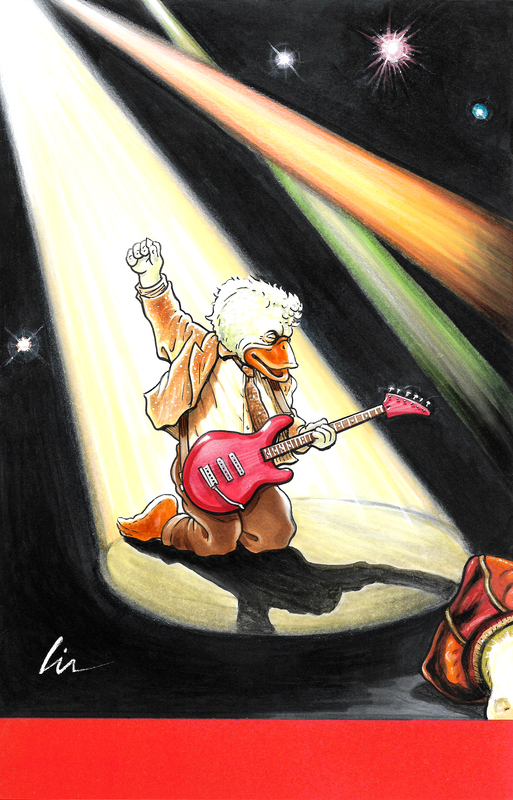 I’ve also got two cons coming up this fall I’ll be set up at- the Delta Fan Fest in Southaven, MS on September 17 & 18, and the Memphis Comic Expo in downtown Memphis on October 22 & 23. Both have some great guests!